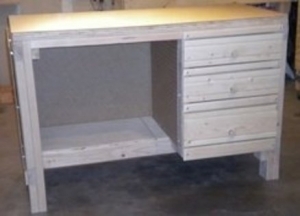 Homemade 3-drawer workbench intended to function as a reloading table. Constructed from oak and pine, with pegboard sides and back. It's a bit hard to see the recess, but it's a good idea. Thanks for the inspiration.